Ripple Grove Press, 9780991386628, 36pp. Mae and the moon love to play together. Their favorite game is hide and seek. 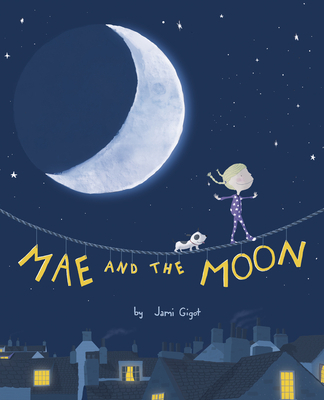 But when the moon disappears one evening and cannot be found, Mae wonders what happened and begins to worry. Determined to find her glowing friend, Mae takes matters into her own hands and sets off on a wonderful and curious voyage through her imagination. This charming book, beautifully illustrated in soft moonlit hues, will capture the hearts of moon gazers everywhere. Jami has always loved a good story. As a child she would secretly read by moonlight well past her bedtime. As she got older she collected comic books, became mesmerized by the advent of digital animation, and developed a passionate interest in the relationship between story and pictures. She moved from her hometown of Madison, Wisconsin to Vancouver, BC where she studied digital animation and VFX at Vancouver Film School. She has worked as a Digital Artist and Texture Painter on several films including Avatar, Tim Burton's Charlie and the Chocolate Factory, Captain America. Driven by her wild imagination and inspired by her children and memories of childhood, she is now honing her illustration skills, and putting pen to paper to create her own picture books. After living in Madison, Los Angeles and London, she has returned to Vancouver where she currently lives with her husband and two children, both of whom happen to be incredible moon spotters. cardboard rocket in order to find her lunar friend. Soon though, the moon reappears and all ends well. the moon, as each moon phase is pictured and identified on the final pastedown.